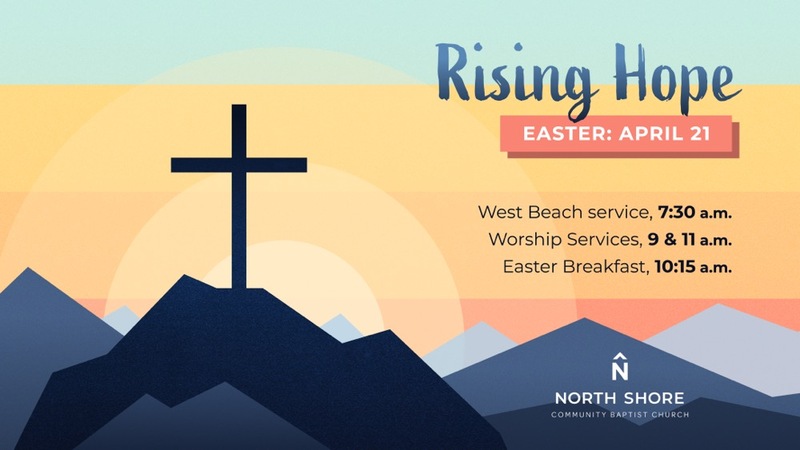 Join us for our special Easter weekend services at NSCBC! At 7pm on April 19, we will gather together in solemn recognition of the sacrifice of Christ. During this Tenebrae Service we will gradually dim the lights until it is dark. We will reflect on the seven last words of Christ through music, readings, and hearing stories of what Jesus’ death means for us. On April 21 we will joyfully celebrate the resurrection of Christ! This short, informal beach service will include singing, readings, and a brief message. Dress warm, because the early morning ocean breeze may be chilly! Light breakfast refreshments will be provided at the beach. Light breakfast refreshments will also be available in the NSCBC Family Room beginning at 8am. These joyful services are filled with exuberant singing and praise to our risen Lord! We will have baptism for those who have decided to publicly profess their faith in Christ and we will hear a sermon about the miracle of Jesus’ resurrection. There will be no Sunday School or Christian formation classes during the second service. Enjoy delicious food and have fun hanging out with new friends and old during a relaxed, full breakfast between the two morning worship services. Sign up here to let us know you’re coming and if you’re able to bring a shareable food item or help with setup/cleanup. Get a free picture with your family or friends at our photo booth, which will be open before and after both 9 & 11 services and during the breakfast! You can find us at 9 Hart Street, Beverly MA. If you need help with directions our church office will be able to help you 978-927-2014.